Like all other baby products, baby nursery furnishings are designed for average heights. Tall parents have needs too, starting with a taller than average baby changing table. Nearly all baby changing tables are built to around 37" tall. This means a lot of stooping and sore backs for anyone over 5' 10" or so, let alone someone well over 6 feet. Dad and mom can spend several minutes at a changing table depending on the job at hand. So, it's really problematic to bend over when a tall parent already has a sore back from bending over for every other baby accessory. Most of them sit on the floor! So there's a lot of bending and stooping. You shouldn't have to stoop over baby nursery furnishings too. Do your back a favor and get an alternative to low baby changing tables. After all, we found only ONE that is significantly taller than average. The Athena Grace 3-drawer changing table comes in at 40" high, but that includes the decorative backing. It is a little taller than average, however. Seriously, your back will ache stooping over an average-height changing table, designed for the average woman of 5'4". So, the next best thing lots of tall parents will tell you is to simply get a more comfortable height dresser, and put the changing pad on top of that in your baby nursery. Of course, without the standard changing table rails to hold the pad in place, you will want to SECURE THE PAD TO THE TOP OF THE DRESSER FOR SAFETY, AND NEVER TURN AWAY WITH BABY ON TOP. With that solution, our little one gets changed and neither mom nor dad is stooping for the pooping. The drawers of a dresser offer much more functional space for the baby nursery too, rather than the simple shelves or clunky baskets of changing tables that are just as expensive. Here's the kicker. 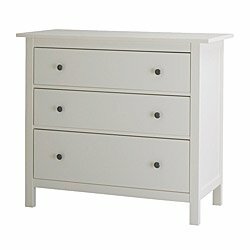 A nicer dresser at Ikea cost us $169, LESS than the average changing table too. So do your back a favor and leave most baby changing tables in the store. It's available in store or here. At the birth of her fifth child, a friend told us she registered for nothing but two things -- a high chair, and a glider chair! Because they're harder to tip over and padded top to bottom, they've come to take the place of a traditional rocking chair in a baby nursery. A glider chair is absolutely wonderful, and though not a necessity, it's a splurge that's worth the cost if possible. We've rocked our little guy to sleep, slept in it ourselves, read a book from it, and more. We're sure this chair will be with us long after we get rid of a crib. Glider chairs come in a huge assortment of sizes, not just higher backs, and longer seats, they're actually sized for different sized people, but they're not marked that way. It was a try-and-try-again kind of a vetting process to select the chairs that are truly big enough to work for taller-than-average parents. The trick with choosing a glider chair, is to see if you can rest your head all the way back and still hit the backrest, versus have the back of your head higher than the chair. You must have that head support height to doze or really enjoy the recline. You want plenty of room under your thighs and hips too. The truth is, largest and most comfortable for tall parents are also some of the most expensive. The gliders from Dutailier are really roomy, and around $479 for the chair, $189 for a matching ottoman and up. Someone over 6'2" can fit in their bigger models, like the above "Grand Modern Glider," comfortably. The important part of fitting in a glider chair is also having enough head room, to lay a weary one back, and have it hit the headrest, not above. Another brand with several models large enough is Shermag. The Shermag Tea lock glider, and the Shermag Oak Lock glider chair are big enough and tall enough for even a 6'5 1/2' man. They are slightly less pricey too, as you can find them in the $329 range, total. Stork Craft, also has some larger-than-average glider chairs at bargain prices. 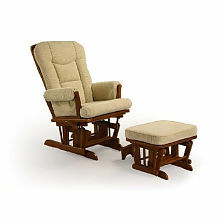 The Stork Craft Tuscany Glider & ottomaan, is particularly roomy, and in the $200 range on sale. However, like most brands, the "big size" guarantee is not true across all Shermag or Stork Craft glider chair models. Several of them are small and though they look like "tall" chairs, they are for smaller bodies. Don't just buy the brand thinking it looks tall. There are plenty of other Shermag models that look the same, but are actually smaller. They don't always publish the measurements either. Get the tall models like the one we list here. Not all models are always in stores, you can generally get them online. As for almost every other glider chair in the major stores, the seat bottom was too small, or the back not high enough for both parents. This is by design. A 5' tall girlfriend had to take her glider chair back to the store because it was too big and high for her to get out of. So, you definitely need to pick a glider chair for size. Lastly, avoid the arm-chair style glider/rockers. They are too low to the ground for a tall person to rise out of and stand up! When you add a baby to your arms, it's nearly impossible to get out of those chairs comfortably. The low-rise back means you'll have no head support either. So either buy the tall ones for your baby nursery, (Dutailier, or these styles of Shermag), or carefully sit in all of them before your purchase, and buyer beware. Other glider chairs were so small that when we sat in them and stood up, the chair came up with us! It was practically stuck to our rear ends. Baby cribs are designed at a height from which a fall might not be too traumatic, should your baby manage to crawl out. So while it's unlikely you'll find a crib that's hugely taller than most, you will want to get one with varying mattress heights as the baby grows. This way, when he's new, and you're doing LOTS of picking up and putting down, it's a little easier on your back to have the baby sleeping on the top mattress setting. An absolute must for baby safety; set the mattress to the lowest position when a baby can pull him or herself up to standing at the rails. When standing, the rails should be at least 3/4 of the baby's height. This is again, where we sometimes find tall baby challenges. You'll undoubtedly hear a lot about mysterious "crib extenders" in forums, chats and other internet locations devoted to the baby nursery, but we have yet to actually find a true, verifiable source to buy them. It seems they're nearly an urban myth, so don't put the hope of crib extenders in your solutions basket just yet. At one time, an alternative solution was a high-pitched crib tent. However, all the makers of the last five years seem to have discontinued their products. The only crib tents available now are flush with the top of the crib, offering no height extension or security. Searching for tall cribs for tall toddlers? The Foundations Hideaway Folding Crib is 2 inches smaller than a standard crib, (24 inches by 38 inches), but the railing is high enough for children up to 35 inches tall. It does not have drop sides, but is one of the tallest cribs we've found! Fantastic for a truly tall baby, able to climb out of a crib too soon, if the sides are too short. These particular cribs are 35 inches high mattress to top of rail! All in all, you'll be happier making your baby nursery friendly for tall parents too. And finally, if, to accommodate height, your furniture seems a little of a mis-match, there's a solution for that too. Click here for creative baby nursery design ideas that can bring it all together no matter what pieces you have!